Dr. Alexis Delgado graduated the medical school from Rutgers New Jersey Medical School and completed his residency program at University of Miami School of Medicine. A fellowship followed at the University of California San Diego soon after that. Dr. Delgado is specialized in Pulmonology and board certified in Pulmonary Disease, Internal Medicine and Critical Care Medicine. 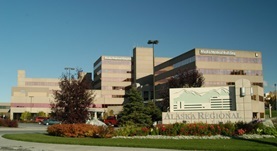 He has been in practice for more than 11 years and is affiliated with Alaska Regional Hospital.